Click to pin the recipe! I found this recipe at The Simple Dollar in a round up of cheap, healthy Dinner with My Family recipes, and I was intrigued. I love butternut squash and bought it every week at Aldi last summer - and this year we're growing it in our garden so I've been looking for ideas for what to do with it. Taste: I'm not generally a huge fan of blue cheese, but I thought the combination might be intriguing. It was okay, though I will probably try a different cheese next time - feta or maybe mozzarella, which I always have on hand. 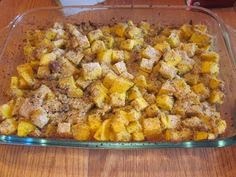 I might also reduce the baking time, as the squash was very tender and I usually like it to have a bit more of a bite to it. Reception: I'm the only one who ate this, so apparently I'll be eating the whole pan. Good thing I'm eating for two, har har. Pickle politely took two nibbles out of a piece of squash and Peanut looked skeptical at me at the very mention of it. I might freeze half of it and see if it keeps, because of course I used a GIANT squash so I have a ton of it left over. Anecdata: Cheap, easy to have pretty much everything on hand, easy. Not much to dislike about this!